I have a question about your upcoming film, Charlie and the Chocolate Factory. 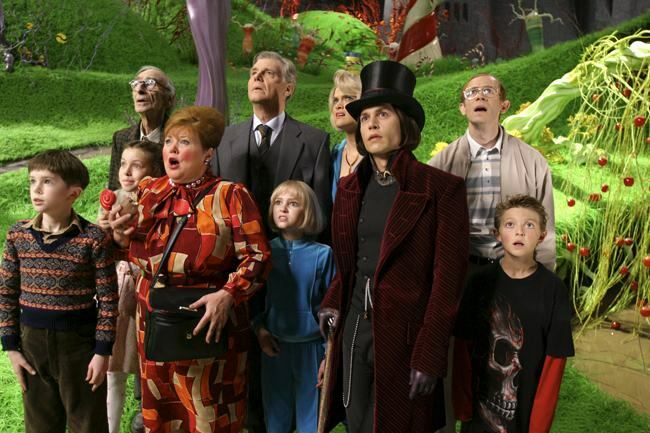 What made you decide to have each child bring only one guardian to Wonka’s factory, and how did you choose which one would go? In Roald Dahl’s book, each of the four rotten kids (Veruca, Violet, Augustus and Mike) brings both of their parents on the tour of the factory. Charlie only bring Grandpa Joe, for reasons that are never entirely clear. According to the rules on the Golden Ticket, he’s allowed to bring two parents, but he doesn’t. When Tim Burton and I first sat down to talk about how we were going to adapt Dahl’s book for the screen, the two-parent issue was one of my first questions. In addition to being a little unfair to Charlie, having each of the rotten kids bring both parents presented a lot of problems. With a book, the reader can conveniently forget that Mrs. Teavee hasn’t said anything for a long time. In a movie, however, that character is always going to be on-screen. Which means she needs to be doing something, saying something. She has to interact with all the other characters in the scene, who in turn have to interact with each other, which steals focus from Charlie, Willy Wonka, and the rotten kids. Basically, twice the parents means everyone gets half as much to say and do. So we quickly decided that the rule on the Golden Ticket would be that every kid gets to bring one parent or guardian. No fuss, no muss. Then the question becomes, which parent goes with which kid? In my mind, piggy Augustus got that way because he had a mother who equated food with love. So Mrs. Gloop would be the first parent. We don’t learn much about her except that she and her husband own a sausage shop in Germany. Violet Beauregarde claimed to be the world record-holder in chewing gum, so we decided to make her hyper-competitive, her ego stoked by sports mom Ms. Beauregarde, herself a former baton champion. We never say anything about Violet’s father. Veruca Salt is a daddy’s girl gone wicked, manipulative and bossy. So it only made sense for her to bring her father, a British nut baron. Finally, there’s Mike Teavee. In Dahl’s book, he’s obsessed with TV westerns and shoot-em-up cop shows. Updating it a bit, we gave him violent videogames and a well-meaning but completely over-his-head father, who is literally bullied by his son. Even with just these four characters, it took work to find enough for everyone to do and say. In the Chocolate Room, for instance, we have to keep track of Willy Wonka, Charlie, Grandpa Joe, Augustus, Mrs. Gloop, Violet, Ms. Beauregarde, Veruca, Mr. Salt, Mike and Mr. Teavee. That’s eleven characters, not counting the Oompa-Loompas. If we’d added four more parents to the scene, we’d probably still be shooting it. Did I ever watch the original Charlie and the Chocolate Factory?